What's the Average Mattress Lifespan? Is It Time To Replace My Mattress? Mattress lifespan is a topic that gets frequently brought up to the Mattress Junkie team. We get asked over and over about how long you should keep your mattress. You wouldn’t believe the stories about someone’s great aunt keeping their mattress 30 years and still sleeping great. 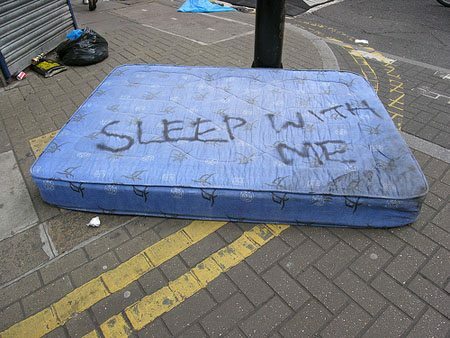 While that’s completely unsanitary, there are some people who swear by an old mattress. So, what’s the proper mattress lifespan? Well, the answer is not as simple as you would think. Mattresses don’t have a clear cut expiration date so often times, we end up keeping our mattresses long after their lifecycle. If you are like the majority of people, you don’t have a spare $800-$1500 sitting around for a new mattress every few years. Since there’s no set formula for your mattress lifespan, we put together some guidelines to help you determine if you are ready for an upgrade. You aren’t sleeping well. Tossing and turning all night can be a real pain, literally. If you find yourself waking up frequently and tossing and turning, do yourself a favor and upgrade your mattress. You will be shocked at how much better you feel when you have the proper support. All mattresses lose their support over time so if you have had yours for a few years, the support is definitely not what it used to be. You wake up in pain or stiff. Just because you are getting older doesn’t mean you should feel achy when you wake up. Mattresses lose support as the age and as we age, we need more support. Any sagging or wear that you can see with the naked eye should be an instant red flag that you are in the market for a new mattress. Don’t wait around to make the switch because your mattress condition is not going to improve on its own. You sleep better away from home than you do in your own bed. You shouldn’t sleep better away from home. If you have a higher quality mattress that’s still in its prime, your rest at home will be the highest quality you will find. If you find yourself sleeping better away from home, you should get a new mattress as soon as possible. There’s no place like home…. If you are over 40, you shouldn’t keep your mattress over 5-7 years. As we age, our bodies respond to pressure differently. An aging mattress is not helping your body feel any better. Getting older is hard enough, you shouldn’t make it any worse with your mattress. Your current mattress is between 7-10 years old…. All mattresses should be replaced after 10 years regardless of how attached you are. The industry mattress lifesp range for a high quality mattress is 7-10 years. Your mattress lifespan is a vital part of the healthy sleeping process. Without a standard formula that works for all consumers, mattress lifecycles have varied from household to household and from individual to individual. We hope our tips above can help you make an informed decision about your current mattress lifespan. Always remember, if you are on the fence with your mattress health, odds are usually in favor of replacing. New mattresses will work wonders for your overall health. Go ahead and get that new mattress ordered today. After all, you could take advantage of the 100+ night satisfaction guarantee that many online mattress retailers are offering and if you don’t sleep way better, just hit up customer service and get a full refund. You don’t have anything to lose by taking advantage of the sleep guarantee offered. You never know, those back issues so many struggle with could become a thing of the past. ← Which online mattress company is best for me?